Los Angeles (AINA) -- In the early part of the 20th century, the Ottoman government carried out a deliberate and systematic mass ethnic cleansing of its Christian inhabitants, namely the Assyrians, Armenians and Greeks. The proclamation of a fatwa for jihad against the Christians in Turkey quickly spread to northwestern Persia, in the densely Assyrian populated region of Urmia (Urmi). From 1914 to 1918, two-thirds of the Assyrian population perished in a genocide that has remained cloaked under a shroud of secrecy. However, the anonymous Assyrian Genocide's staggering losses of 750,000 souls remains ever present in the remembrances of a nation that has vowed to never forget. But mostly, I am still lost in admiration of my grandparents' sense of dignity, honor and grace that was the code by which they lived. They were among the more than 70,000 Assyrians forced to flee Urmia in the final mass exodus of the winter of 1918 that split off in two opposing directions. My 18 year-old maternal grandmother, Maghdleta, whose husband had just been murdered, fled north towards the Russian frontier, while my paternal grandparents bundled their newborn infant and followed other Assyrians south towards Mesopotamia. Not everyone was as lucky as they were to reach safety. Though the perpetrators of these crimes against the Assyrians were Ottoman Turks, Kurds and local Turks in Persia, I was never taught to hate an entire race of people. Everyone must be judged on his or her own deeds. "Don't condemn one man for the sins of another even if they share the same blood or name," my grandmother would say. 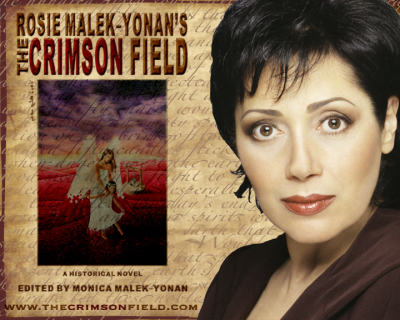 In 2005, I published my book, The Crimson Field, chronicling the life of Maghdleta, my grandmother's hellish reality of the Assyrian Genocide. At the time, I wasn't aware of the extraordinary journey I was about to embark upon. I was simply making a record of one Assyrian family's life. Against everyone's advise, I sent a copy of The Crimson Field to a Turkish journalist from Istanbul. She wrote back saying: "It will be a privilege for me to read your book and to have a deeper insight about one of the oldest cultures of the world and their great tragedy. How I wished my heartfelt apology could alleviate the sufferings the Assyrian people have gone through! Your considering me as an elder sister would be a great consolation for my feeling of shame for being a member of a nation which is responsible for those sufferings." The book I had written to document my family's history was rapidly leading to bonds across the seas with strangers whom I have come to know as friends. However, the Turkish journalist's statement to me reinforced my belief that there are courageous people who will stand with the Assyrians in their quest for the recognition of the past atrocities committed against my nation. Truth shines its own light and will emerge through darkness. In her final review of The Crimson Field she writes: "It's a deeply moving, impressive, inspiring book, full of emotions and vivid depictions of life. I admire it." But it is naive to presume that one journalist's viewpoint is representative of all Turks. Clearly there still exists a deep racial hatred and intolerance that is passed on from generation to generation. Since 2005, my book's website has been hacked into by Turks several times (AINA 1-21-2008, 11-20-2007). The latest and sixth such incident occurred just last week. The Turk behind this malicious act was most probably a young hacker who knows nothing of the circumstances of the Assyrians who seek justice and not revenge. The Turkish government's shroud of secrecy to suffocate the Assyrian Genocide is slowly slipping as more and more hackers continue to bring focus on this issue through Internet vandalism. Though I cannot condone such dreadful behavior, I can't help but chuckle at the end result.